THE GHOST IN THE NOONDAY SUN is a Peter Sellers film almost no one has seen. 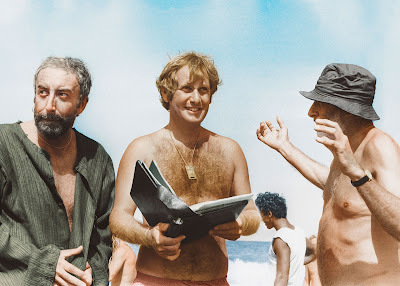 Made in 1973 at the instigation of Seller and fellow Goon, Spike Milligan, the film seemed like a good idea on paper. The biggest comedy star in the world would make a comedy with the hottest director in the world. It was a can lose proposition, and money was thrown at the production before the script was locked down. However things went wrong from the start as the pirate ship central to the story sank when it arrived on location. As if things couldn't get worse Sellers arrived to begin shooting only to decide he didn't want to do the film any more and did everything he could to stop production. The film was finished but it broke numerous friendships, wounded director Peter Medak's career and left everyone stinging from their time in hell. What exactly happened and why was something that director Medak has been trying to work out over the last forty odd years. In an effort to put it to rest and move on Medak revisits the film, talks to those still alive, and finds a treasure trove of information he was completely unaware of. Medak says at the start that this is the sort of making of that is usually done either after everyone is dead or by people not involved in the film under scrutiny. He reckons that this maybe the first time someone involved with a story like this has gone back to see what went wrong. The result is a masterpiece of a film. The simple answer to what went wrong is Peter Sellers. Sellers was a comic genius but a deeply disturbed man who was known to be difficult. Medak thought he would have a fighting chance because he was friend, but he was dead wrong, Sellers was not giving quarter to anyone. Sellers was by all accounts functional, but mentally ill. He was moody, manic and prone to poor behavior. He had to be the center of attention, so when one of the first scenes filmed was found to be hysterical, despite his having no part in it, he wanted out of the film. Years later, when Medak met Sellers after years of estrangement he found Sellers would genuinely have no recollection of what actually happened. Make no bones about it, this film makes it clear that people with mental illness need to be treated. Medak has made a very complex film. There is a great deal going on and there is no way that I can hope to express how really good this film is or what all the threads are. We have the story of the film, of Medak's journey to find closure, a "you are there" look at Seller's and detailed look at how movies get made, a discussion of mental illness and a couple of others as well. All of them are tied together beautifully by Medak who makes every bit vital to understanding what happened. He has also created a film that will make you laugh out loud at the insanity of it and yet will reduce you to tears in the end. Frankly I need another time or two through to be able to really do the film justice. Its a feeling that has grown since I saw the film a few days ago since in thinking about the film I realized just how much Medak has put before us to ponder. This isn't just about a movie but about life on a larger level. On it's own Peter Medak's THE GHOST OF PETER SELLERS is a must see for anyone who loves the movies. It is a wonderful look at film, at stars and what can go horribly wrong and how it can affect our lives. It is a hell of a tale expertly and grippingly told.